- Can be used to correct , curved toes, bending toes, relieve bunion pain. - Unique elasticity and softness. Reasonable separate toes, hallux valgus correction of effective prevention. - Ease the pressure foot and the ground, reasonable improvement forefoot negative force due to unreasonable stress. - Well vent, breathable, soft and comfortable gel material, effectively alleviate the - Washable & reusable on right or left foot. Suitable for Women and Men. 2. It is viscous after washed, please evenly sprinkle your own talcum powder on those pads before each use. 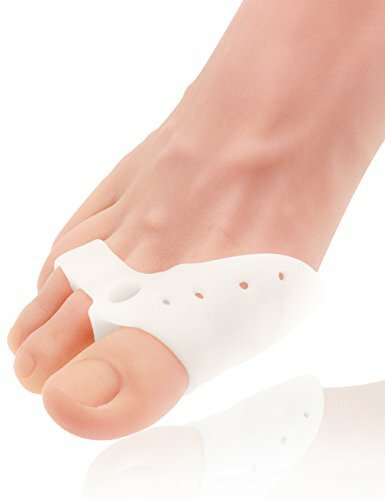 FUNCTION OF TOE SEPARATORS: This bunion corrector is great for bunions, hallux valgus, hammer toes, mallet toes, claw toes, overlapping toes align and straightening toes with gentle pressure. Free you from foot pains and uncomfortable. GOOD WAY TO USE: The hole between big toe and second toe design for different hallux valgus symptoms, it can be stuffed cotton or sponge if you need more spacers for toes. FUNCTION OF TOE SEPARATORS: Toe separators is great for bunions, hallux valgus, hammer toes align and straightening toes and other foot problems. WITH FOREFOOT PAD CUSHION: They can greatly reduce the fatigue at the bottom of the feet. Provides you enhanced bunion coverage, protection, easing of discomfort and pressure. The side flap keeps shoes from rubbing along the sensitive skin of the bunion. ANTI-SKID AND BREATHABLE DESIGN: The air holes and skid-proof lines, making your feet breathe freely and anti-skid all the day. Provide great cushioning for forefoot and quick feet pain relief.